ATX Power supplies and Model Railroads. Excellent video on this by Central Jersey Conrail Group. As the author of the video had mentioned that he did not know much about ATX power supplies, I have collated information here from Gabriel Torres’s work at hardwaresecrets.com for the reader. I chose the Corsair AX760 as my power supply having used their products on several PC builds with my son. Here is a pin side view of the ATX Connector. Power supplies used on the PC are based on a technology called “switching mode” and thus are also known as SMPS, Switching Mode Power Supplies (DC-DC converter is another nickname for switching mode power supplies). In this tutorial we will explain you how switching power supplies work and we will provide a journey into the PC power supply showing you its main components and what they do. Linear power supplies work by getting the 127 V or 220 V from the power grid and lowering it to a lower value (e.g., 12 V) using a transformer. This lower voltage is still AC. Then rectification is done by a set of diodes, transforming this AC voltage into pulsating voltage (number 3 on Figures 1 and 2). The next step is filtering, which is done by an electrolytic capacitor, transforming this pulsating voltage into almost DC (number 4 on Figures 1 and 2). The DC obtained after the capacitor oscillates a little bit (this oscillation is called ripple), so a voltage regulating stage is necessary, done by a zener diode or by a voltage regulator integrated circuit. After this stage the output is true DC voltage (number 5 on Figures 1 and 2). Figure 1: Block diagram for a standard linear power supply design. Figure 2: Waveforms found on a linear power supply. Also, the higher the current (i.e., the power) demanded by the circuit fed by the power supply, the bigger the transformer is. The power supply used on the PC uses an even better approach: it is a closed loop system. The circuit that controls the switching transistor gets feedback from the power supply outputs, increasing or decreasing the duty cycle of the voltage applied to the transformer according to the PC consumption (this approach is called PWM, Pulse Width Modulation). So the power supply readjusts itself depending on the consumption of the device connected to it. When your PC isn’t consuming a lot of power, the power supply readjusts itself to deliver less current, making the transformer and all other components to dissipate less power – i.e., less heat is generated. On linear power supplies, the power supply is set to deliver its maximum power, even if the circuit that is connected to it isn’t pulling a lot of current. The result is that all components are working at their full capacity, even if it isn’t necessary. The result is the generation of a greater heat. On Figures 3 and 4 you can see the block diagram of a switching power supply with PWM feedback used on PCs. In Figure 3 we show the block diagram of a power supply without PFC (Power Factor Correction) circuit – used by cheap power supplies – and in Figure 4 we show the block diagram of a power supply with active PFC circuit, which is used by high-end power supplies. Figure 3: Block diagram for a switching power supply design with PWM (no PFC). Figure 4: Block diagram for a switching power supply design with PWM and active PFC. You can see what is the difference between a power supply with active PFC and one without this circuit by comparing Figures 3 and 4. As you can see, power supplies with active PFC don’t have a 110/220 V switch and also don’t have a voltage doubler circuit, but of course they have the active PFC that we will talk more about later. This is a very basic diagram. We didn’t include extra circuits like short-circuit protection, stand-by circuit, power good signal generator, etc to make the diagram simpler to understand. If you want detailed schematics, see Figure 5. If you don’t understand electronics, don’t worry. This figure is just here for the readers that want to go deeper. Figure 5: Schematics for a typical low-end ATX power supply. You may be asking yourself where is the voltage regulation stage on the Figures above. The PWM circuit does the voltage regulation. The input voltage is rectified before passing the switching transistors, and what they send to the transformer is square wave. So what we have on the transformer output is a square waveform, not a sine waveform. Since the waveform is already square, it is very simply to transform it into a DC voltage. So after the rectification after the transformer, the voltage is already DC. That is why some times switching power supplies are also referred as DC-DC converters. The loopback used to feed the PWM control circuit is in charge of making all the necessary regulation. If the output voltage is wrong, the PWM control circuit changes the duty cycle of the signal applied to the transistors in order to correct the output. This happens when the PC power consumption increases, situation where the output voltage tends to drop, or when the PC power consumption decreases, situation where the output voltage tends to increase. Everything before the transformer is called “primary” and everything after it is called “secondary”. Power supplies with active PFC circuit don’t have a 110 V/ 220 V switch. They also don’t have a voltage doubler. On power supplies without PFC, if the 110 V / 220 V is set to 110 V, the power supply will use a voltage doubler, in order to make the voltage always around 220 V before the rectification bridge. On PC power supplies two power MOSFET transistors make the switcher. Several different configurations can be used and we will talk more about this later. The waveform applied to the transformer is square. Thus the waveform found on the transformer output is square, not sine. The PWM control circuit – which is usually an integrated circuit – is isolated from the primary through a small transformer. Sometimes instead of a transformer an optocoupler (a small integrated circuit containing a LED and a phototransistor packed together) is used. As we mentioned, the PWM control circuit uses the power supply outputs to control how it will drive the switching transistors. If the output voltage is wrong, the PWM control circuit changes the waveform applied on the switching transistors in order to correct the output. On the next pages we are going to explore each one of these stages with pictures showing where you can find them inside a power supply. After opening a power supply for the very first time (don’t do this with its power cord attached or you will get an electrical shock), you may find yourself quite lost trying to figure out what is what. But you will recognize at least two things you already know: the power supply fan and some heatsinks. Figure 6: Inside a PC power supply. But you should able to recognize very easily the components that belong to the primary and the components that belong to the secondary. You will find one (on power supplies with a active PFC) or two (on power supplies without PFC) big electrolytic capacitors. Find them and you will find the primary. 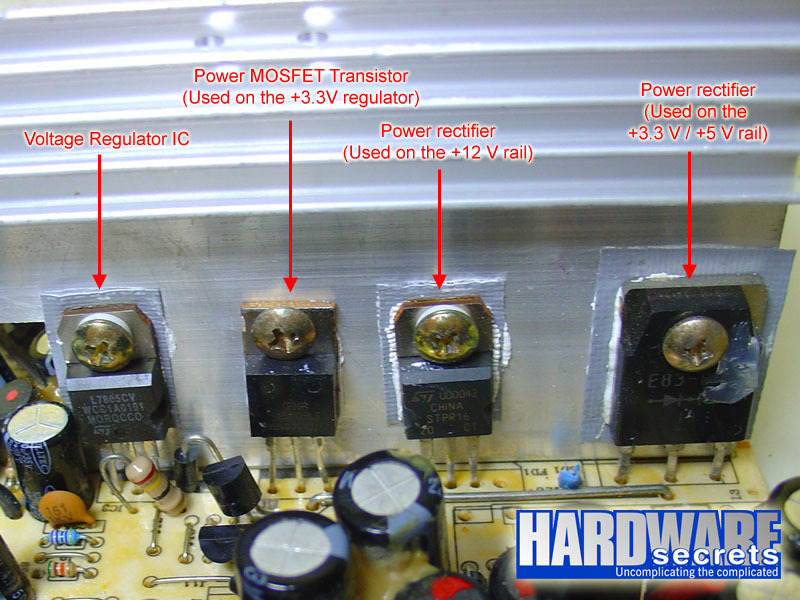 Usually PC power supplies have three transformers between two big heatsinks, as you can see in Figure 7. The main transformer is the biggest one. 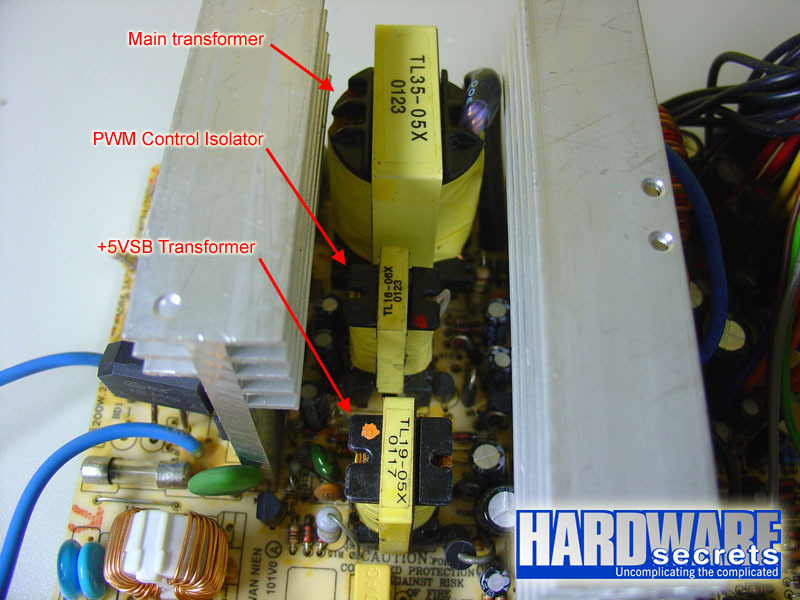 The medium transformer is used to generate the +5VSB output and the smallest transformer is used by the PWM control circuit to isolate the secondary from the primary (this is the transformer labeled as “isolator” on Figures 3 and 4). Several power supplies instead of using a transformer as an isolator uses one or more optocouplers (they look like small integrated circuits), so on power supplies using these components you will probably find only two transformers. We will talk more about this later. One of the heatsinks belongs to the primary and the other belongs to the secondary. On the primary heatsink you will find the switching transistors and also the PFC transistors and diode, if your power supply has active PFC. Some manufacturers may choose to use a separated heatsink for the active PFC components, so on power supplies with active PFC you may find two heatsinks in its primary. 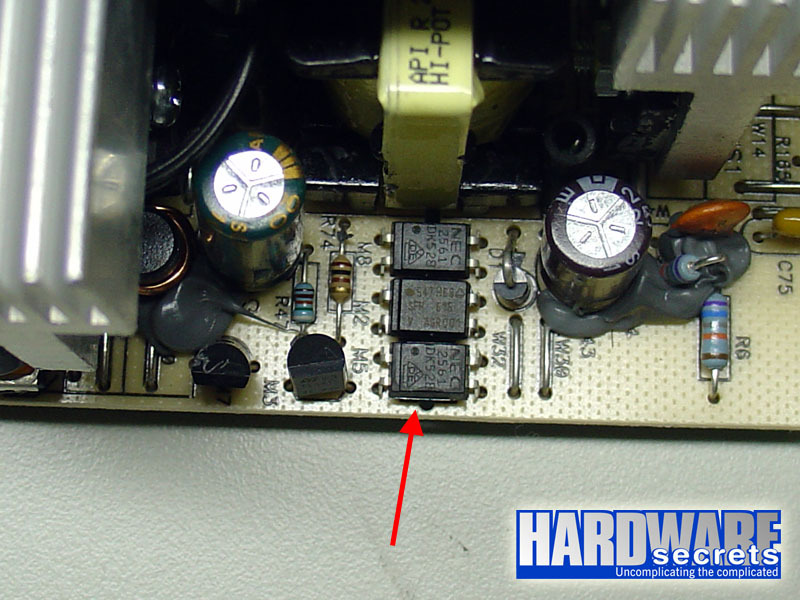 On the secondary heatsink you will find several rectifiers. They look like transistors but they have two power diodes inside. You will also find several smaller electrolytic capacitors and coils that belong to the filtering phase – finding them you will find the secondary. An easier way to find the secondary and the primary is just following the power supply wires. The output wires will be connected to the secondary while the input wires (the ones coming from the power cord) will be connected to the primary. See Figure 7. Figure 7: Locating the primary and the secondary. The first stage of a PC power supply is the transient filtering. In Figure 8, you can see the schematics of the recommended transient filter for the PC power supply. We say “recommended” because many power supplies – specially the cheap ones – won’t have all the components shown in Figure 8. So a good way to check whether your power supply is a good one or not is by checking if its transient filtering stage has all recommended components or not. Its main component is called MOV (Metal Oxide Varistor) or varistor, labeled RV1 on our schematics, which is responsible for cutting voltage spikes (transients) found on the power line. This is the exact same component found on surge suppressors. The problem, though, is that cheap power supplies don’t carry this component in order to save costs. On power supplies with a MOV, surge suppressors are useless, since they have already a surge suppressor inside them. L1 and L2 are ferrite coils. C1 and C2 are disc capacitors, normally blue. 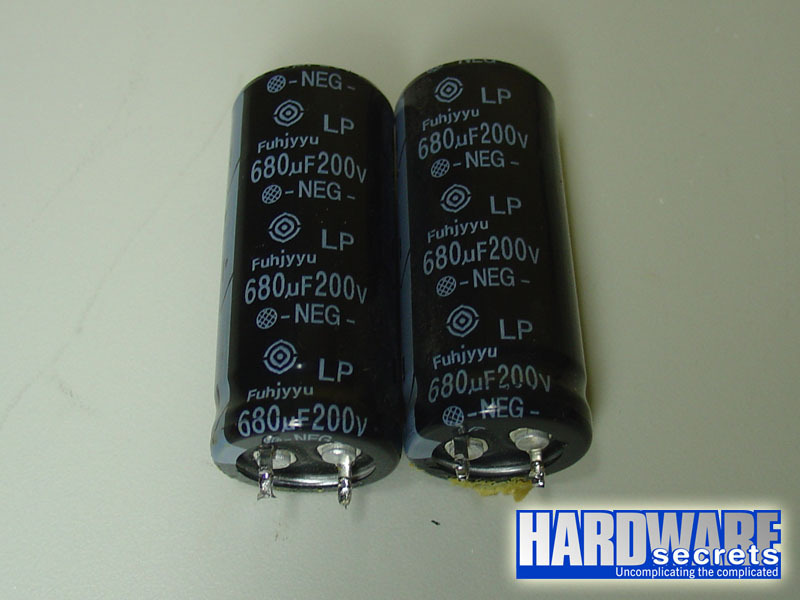 These capacitors are also called “Y capacitors”. C3 is a metalized polyester capacitor, normally with values like 100 nF, 470 nF or 680 nF. This capacitor is also called “X capacitor”. Some power supplies have a second X capacitor, installed in parallel with the main power line, where RV1 is in Figure 8. X capacitor is any capacitor that has its terminals connected in parallel to the main power line. Y capacitors come in pairs, they need to be connected together in serial with the connection point between them grounded, i.e., connected to the power supply chassis. Then they are connected in parallel to the main power line. The transient filter not only filters the transients coming from the power line, but also prevents the noise generated by the switching transistors to go back to the power line, which would cause interference on other electronic equipments. Let’s see some real-world examples. Pay attention to Figure 9. Do you see something strange here? This power supply simply doesn’t have a transient filter! This power supply is a cheap “generic” unit. 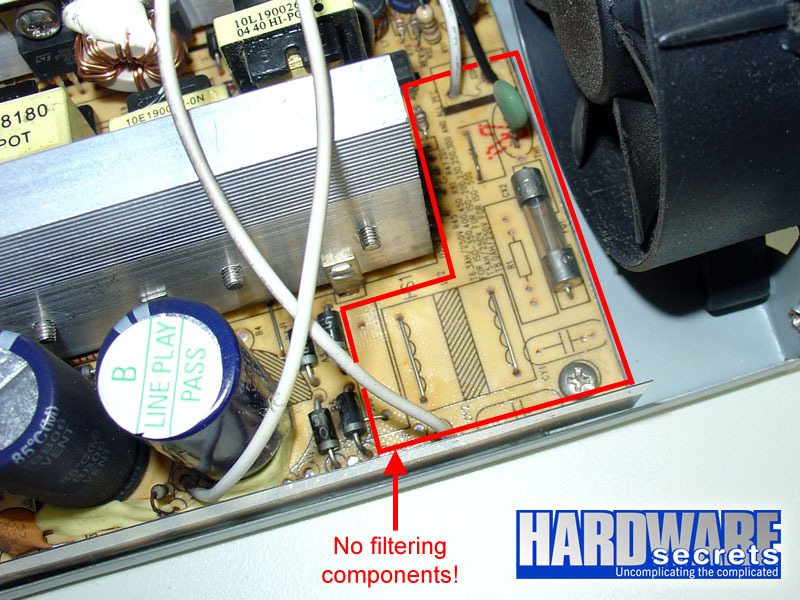 If you pay attention you can see the markings on the power supply printed circuit board where the filtering components should be installed. Figure 9: This cheap “generic” power supply doesn’t even have a transient filtering stage. In Figure 10, you can see the transient filtering of a cheap power supply. As you can see, the MOV is missing and this power supply has only one coil (L2 is missing). On the other hand it has one extra X capacitor (placed where RV1 is in Figure 8). Figure 10: Transient filtering on a cheap power supply. On some power supplies the transient filter can be broke down into two separated stages, one soldered to the input power connector and the other on the power supply printed circuit board, as you can see on the power supply shown on Figures 11 and 12. 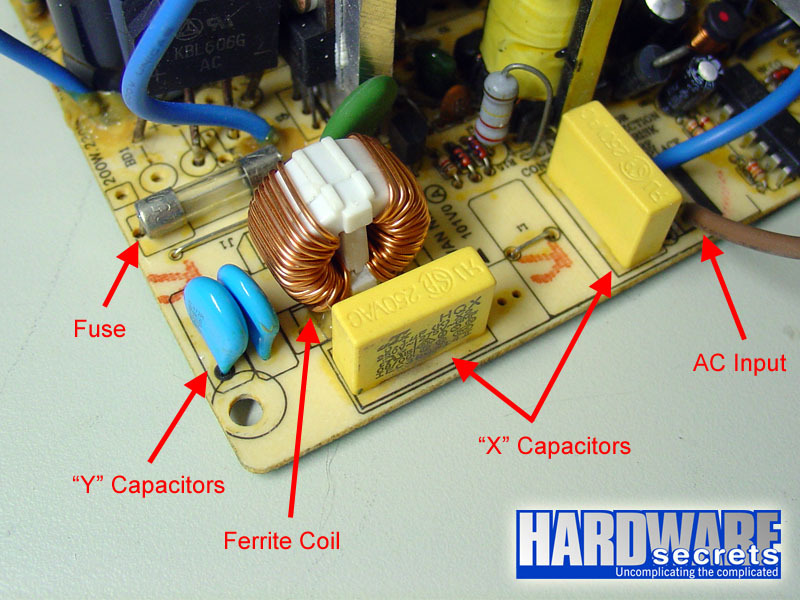 On this power supply you can find a X capacitor (replacing RV1 in Figure 8) and the first ferrite coil (L1) soldered on a small printed circuit board that is connected to the main AC power connector. Figure 11: Transient filter first stage. On the power supply printed circuit board you can find the other components. 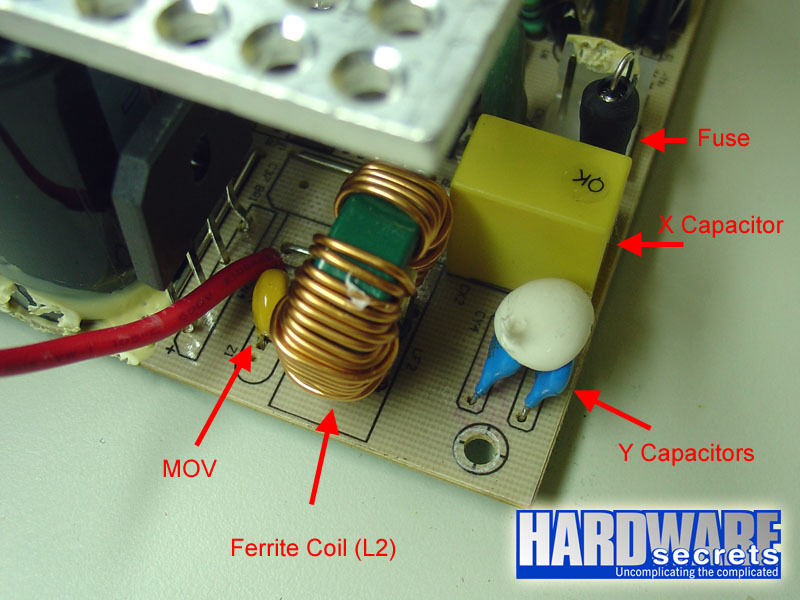 As you can see this power supply has a MOV, even though it is placed on an unusual position, after the second coil. If you pay attention, this power supply has more than the recommended number of components, as it has all components shown in Figure 8 plus an extra X capacitor. Figure 12: Transient filter second stage. This power supply MOV is yellow, however the most common color is dark blue. You should also find a fuse near the transient filter (F1 in Figure 8, see also Figures 9, 10 and 12). If this fuse is blown, beware. Fuses don’t blow by themselves and a blown fuse usually indicates that one or more components are defective. If you replace the fuse, the new one will probably blow right after you turn on your PC. On power supplies without active PCF circuit you will find a voltage doubler. The voltage doubler uses two big electrolytic capacitors. So the bigger capacitors found on the power supply belongs to this stage. Like we mentioned before, the voltage doubler is only used if you are connecting your power supply to a 127 V power grid. Figure 13: Electrolytic capacitors from the voltage doubler. Figure 14: Electrolytic capacitors from the voltage doubler removed from the power supply. Next to the two electrolytic capacitors you will find a rectifying bridge. This bridge can be made by four diodes or by a single component, see Figure 15. On high-performance power supplies this rectifying bridge is connected to a heatsink. On the primary you will also find a NTC thermistor, which is a resistor that changes its resistance according to the temperature. It is used to reconfigure the power supply after it is used for a while and it is hot. NTC stands for Negative Temperature Coefficient. This component resembles a ceramic disc capacitor and is usually olive green. Obviously this circuit is found only on power supplies that have active PFC. In Figure 16 you can study the typical active PFC circuit. The active PFC circuit usually uses two power MOSFET transistors. 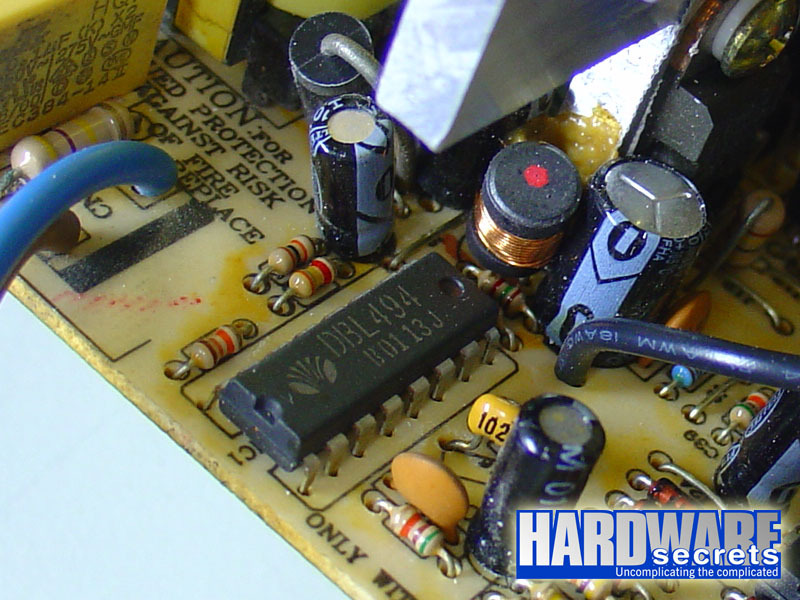 These transistors are attached to the heatsink found on the power supply primary stage. For a better understanding, we labeled the name of each MOSFET terminal, S standing for Source, D standing for Drain and G standing for Gate. The PFC diode is a power diode usually using a packaging similar to power transistors (but having only two terminals), and it is also attached to the heatsink found on the power supply primary stage. The PFC coil shown in Figure 16 is the biggest coil on the power supply. The electrolytic capacitor is the big electrolytic capacitor you will find on the primary section of power supplies with active PFC. And the resistor shown is a NTC thermistor, which is a resistor that changes its resistance according to the temperature. It is used to reconfigure the power supply after it is used for a while and it is hot. NTC stands for Negative Temperature Coefficient. The active PFC control circuit is usually based on an integrated circuit. Sometimes this integrated circuit is also in charge of controlling the PWM circuit (used to control the switching transistors). This kind of integrated circuit is called “PFC/PWM combo”. Let’s now see some real-world examples. In Figure 17 we removed the primary heatsink so you can see the components better. On the right side you can see the transient filtering components that we already discussed. On the left side you can see the active PFC components. Since we removed the heatsink, the active PFC transistors and the PFC diode are missing on this picture. 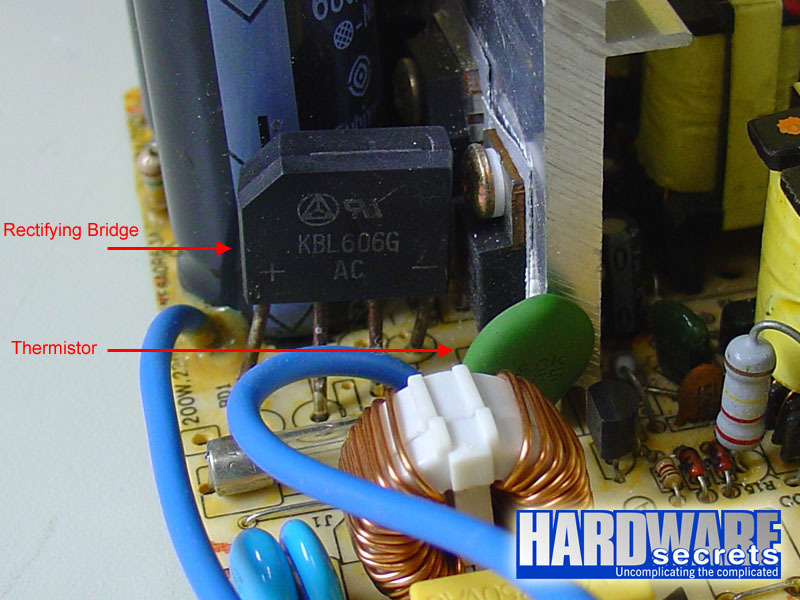 If you pay attention you will see that this power supply uses an X capacitor between its rectifying bridge and the active PFC circuit (brown component below the rectifying bridge heatsink). Usually the thermistor, which resembles a ceramic disc capacitor and is usually olive green, uses a rubber protection, as you can see. 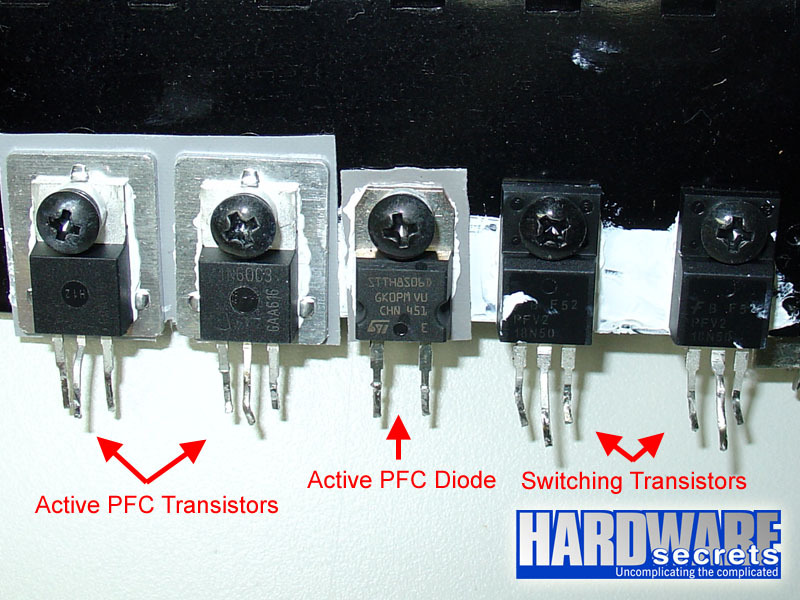 As we mentioned, the power supply biggest coil is usually the active PFC coil. Figure 17: Active PFC components. In Figure 18, you can see the components that are attached to the heatsink found on the primary section of power supply portrayed in Figure 17. You can see the two power MOSFET transistors and the power diode from the active PFC circuit. Figure 18: Components attached to the primary heatsink. 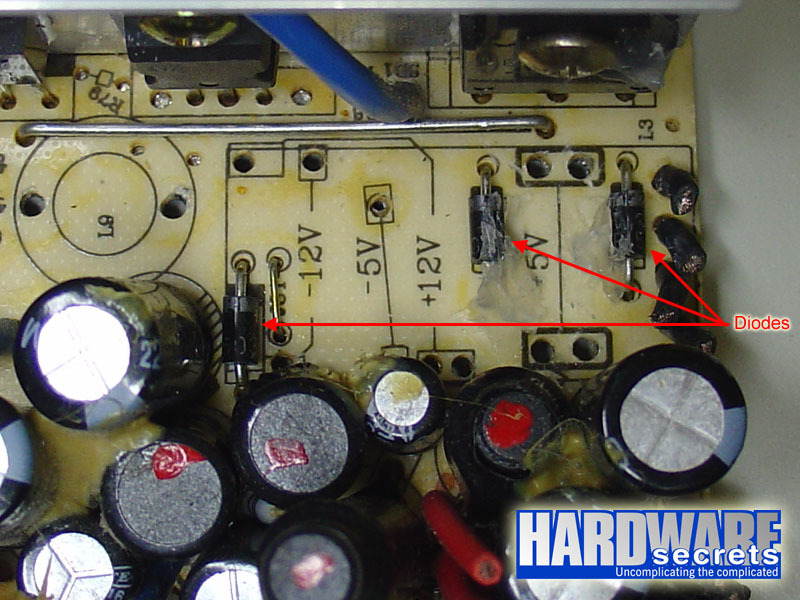 In Figure 18 you can also see the two switching transistors used by this power supply. The switching section of switching mode power supplies can be built using several different configurations. We summarized the most common ones in the table below. Of course we are just analyzing the number of components needed, there are other aspects that engineers should take into account when deciding which configuration to use. The two most common configurations for PC power supplies are the two-transistor forward and the push-pull, and both use two switching transistors. The physical aspect of these transistors – which are power MOSFET transistors – can be seen in the previous page. They are attached to the heatsink found on the power supply primary section. Below we show you the schematics for each one of these five configurations. Figure 19: Single-transistor forward configuration. Figure 20: Two-transistor forward configuration. Figure 21: Half bridge configuration. Figure 22: Full bridge configuration. 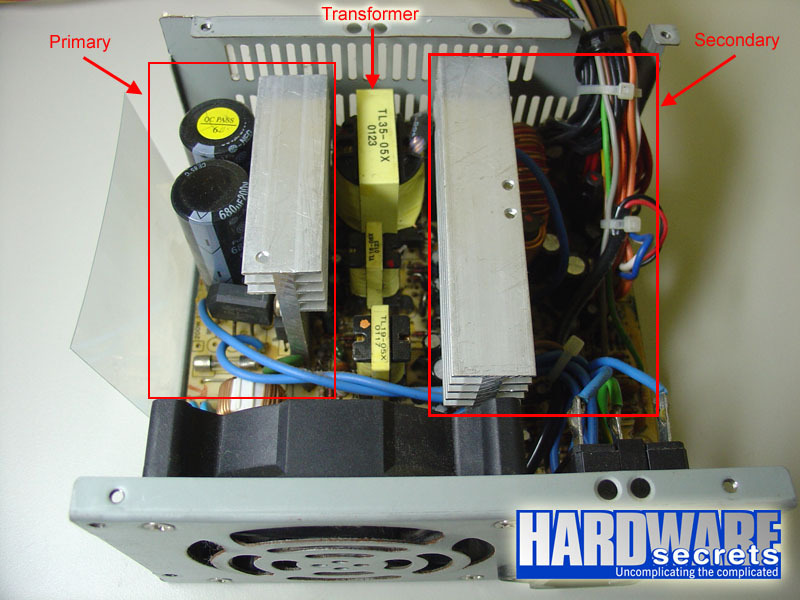 As we mentioned earlier, a typical PC power supply has three transformers. The big one is the one shown on our block diagram (Figures 3 and 4) and schematics (Figures 19 through 23), where its primary is connected to the switching transistors and its secondary is connected to the rectifying diodes and filtering circuits that will provide the power supply DC outputs (+12 V, + 5 V, +3.3 V, -12 V and -5 V). The second transformer is used to generate the +5VSB output. An independent circuit generates this output, also known as “standby power”. The reason why is because this output is always turned on, even when your PC supply is “turned off” (i.e., it is on standby mode). The third transformer is an isolator transformer, connecting the PWM control circuit to the switching transistors (described as “isolator” on our block diagram). This third transformer may not exist, being replaced by one or more optocouplers, which look like a small integrated circuit (see Figure 25). Figure 24: Power supply transformers. Figure 25: This power supply uses optocouplers instead of using a transformer to isolate the PWM circuit. The PWM control circuit is based on an integrated circuit. Power supplies without active PFC usually use a TL494 integrated circuit (in the power supply pictured in Figure 26 a compatible part, DBL494, was used). On power supplies with active PFC sometimes an integrated circuit that combines both PWM and PFC control is used. CM6800 is a good example of PWM/PFC combo integrated circuit. Another integrated circuit is usually used on the power supply, to generate the power good signal. We will talk more about it later. Figure 26: PWM control circuit. Finally, the secondary stage. Here the outputs of the main transformer are rectified and filtered and then delivered to the PC. The rectification of the negative voltages (-5 V and –12 V) is done by conventional diodes, since they don’t demand a lot of power and current. But for the rectification of the positive voltages (+3.3 V, +5 V and +12 V) is done by power Schottky rectifiers, that are three-terminal components that look like power transistors but they have two power diodes inside. The way rectification is done depends on the power supply model and two configurations are possible, shown in Figure 27. Configuration “A” is more used by low-end power supplies. As you can see, this configuration needs three pins from the transformer. Configuration “B” is more used by high-end power supplies. 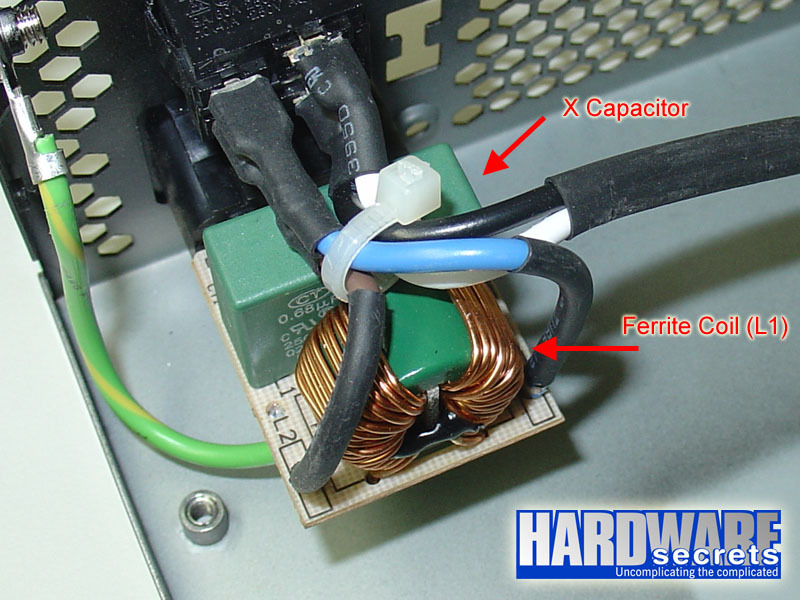 Here only two transformer pins are used, however the ferrite coil must be physically bigger and thus more expensive, and that is one of the main reasons low-end power supplies don’t use this configuration. Also on high-end power supplies, in order to increase the maximum current the power supply can deliver two power diodes can be connected in parallel, thus doubling the maximum current the circuit can handle. All power supplies have a complete rectification and filtering circuit for the +12 V and +5 V outputs, so all power supplies have at least two circuits like the one shown in Figure 27. Adding a +3.3 V voltage regulator to the +5 V output. This is the most common option on low-end power supplies. Adding a complete rectification and filtering circuit like the one shown in Figure 27 for the +3.3 V output, but sharing the same transformer output used by the +5 V rectification circuit. This is the most common option for high-end power supplies. Using a complete independent +3.3 V rectification and filtering circuit. This is very rare and would be found on very high-end and expensive power supplies. To date we’ve seen only one power supply using this option (Enermax Galaxy 1000 W, for the record). Because the +3.3 V output usually uses the +5 V circuit totally (on low-end power supplies) or in part (on high-end power supplies), the +3.3 V output is limited by the +5 V output and vice-versa. That’s why PC power supplies have a “combined power” rating, stating the maximum power that these two outputs can pull together, in addition of each output maximum power (the combined power is lower than the sum of the +3.3 V and +5 V power ratings). In Figure 28 you have an overall look at the secondary of a low-end power supply. Here you can see the integrated circuit in charge of generating the Power Good signal. Usually low-end power supplies use a LM339 or equivalent for this task. You will find several electrolytic capacitor (far smaller than the ones found on the voltage doubler or active PFC circuit) and several coils. They are in charge of the filtering stage (see Figure 27). Figure 28: Power supply secondary stage. For a better shot we cut all the wires and removed the two big filtering coils. In Figure 29, you can see the smaller diodes used on the rectification of the -12 V and –5 V lines, which have smaller current (and thus power) ratings (0.5 A each on this specific power supply). The other voltage outputs have current needs far above 1 A, requiring power diodes for performing the rectification. Figure 29: Rectifying diodes for the –12 V and –5V lines. n Figure 30 we have an example of the components that are attached to the heatsink found on the secondary stage of a low-end power supply. 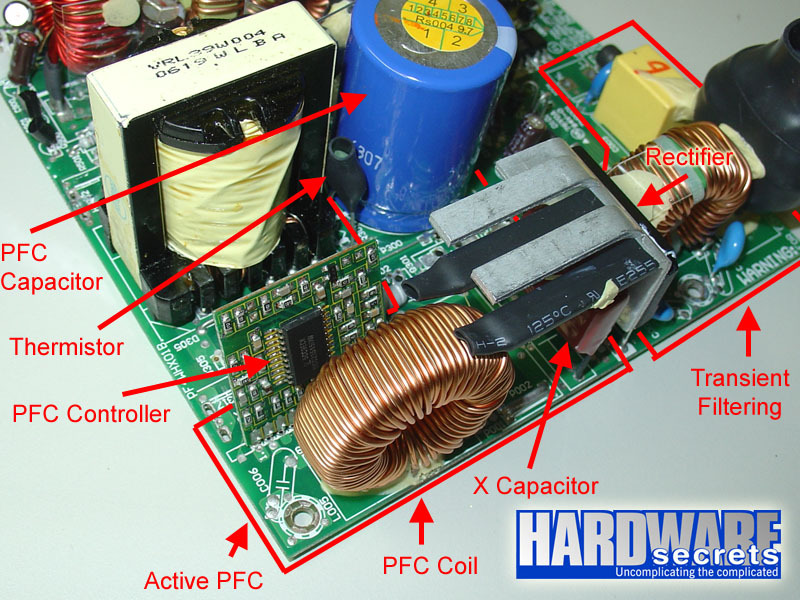 Figure 30: Components found on the secondary heatsink of a low-end power supply. A voltage regulator integrated circuit – though it has three terminals and looks like a transistor, it is an integrated circuit. In the case of our power supply it was a 7805 (5 V regulator), in charge of regulating the +5VSB output. As we mentioned earlier, this output uses a circuit that is independent from the standard +5 V line (see Figure 5 for a better understanding), as it will continue delivering +5 V to the +5VSB output even when your PC is “turned off” (standby mode). That is why this output is also called “standby power.” The 7805 IC can deliver up to 1 A. A power MOSFET transistor for regulating the +3.3 V output. In the case of our power supply the one used was a PHP45N03LT, which can handle up to 45 A. As we mentioned in the previous page, only low-end power supplies will use a voltage regulator for the +3.3 V output – which is connected to the +5 V line. 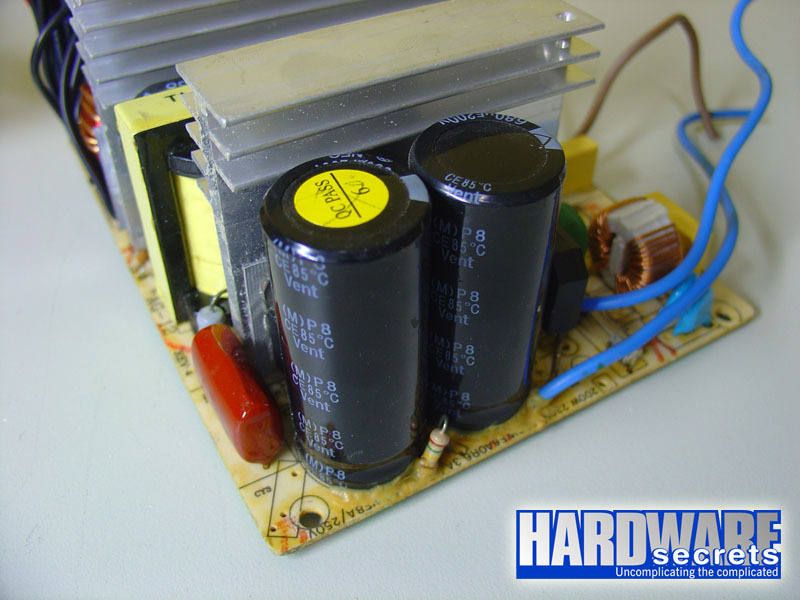 A power Schottky rectifier, which is simply two diodes stuck together in the same package. In the case of our power supply the one used was a STPR1620CT, which can handle up to 8 A for each diode (16 A total). 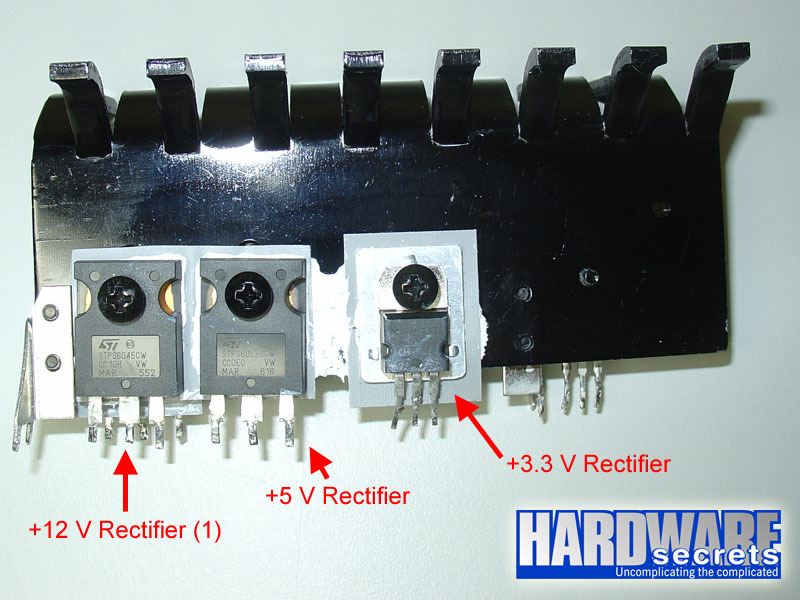 This rectifier is used for the +12 V line. Another power Schottky rectifier. 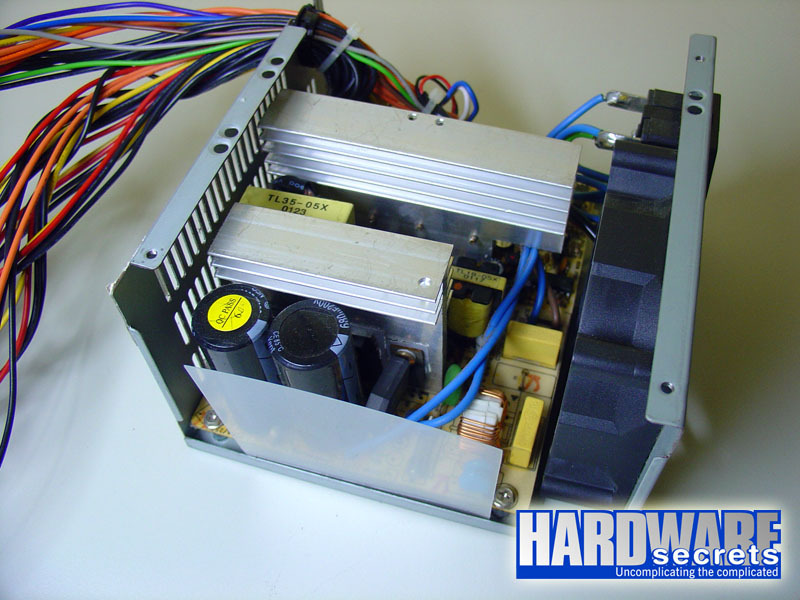 In the case of our power supply the one used was an E83-004, which can handle up to 60 A. This specific power rectifier is used for the +5 V and + 3.3 V lines. Since +5V and +3.3 V lines use the same rectifier, their added current cannot be greater than the rectifier’s maximum current. This concept is called combined power. In other words, the +3.3 V line is generated from the +5 V; the transformer doesn’t have a 3.3 V output, differently from what happens to all other voltages provided by the power supply. This configuration is only used on low-end power supplies. High-end power supplies use separated rectifiers for the +3.3 V and +5 V outputs. 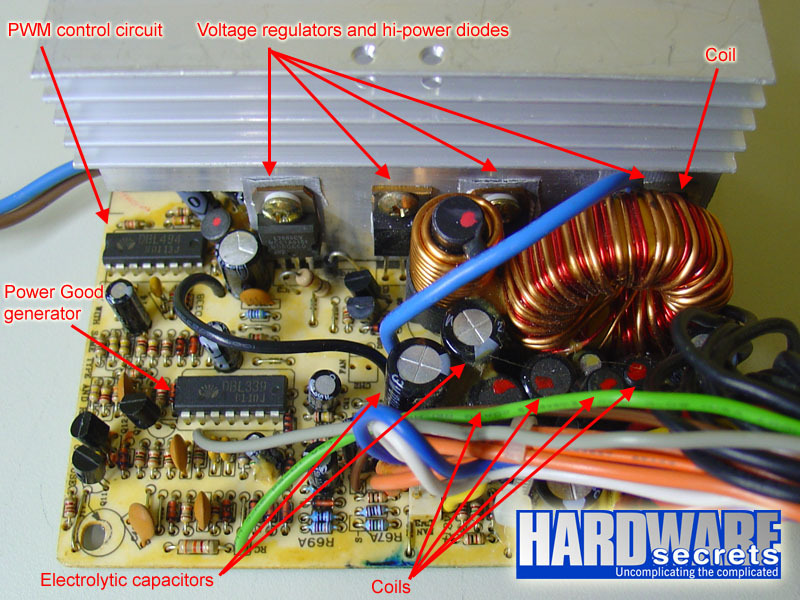 Now let’s take a look at the main components used on the secondary stage of a high-end power supply. Figure 31: Components found on the secondary heatsink of a high-end power supply. Figure 32: Components found on the secondary heatsink of a high-end power supply. Two power Schottky rectifiers for the +12 V output connected in parallel, instead of just one like on low-end power supplies. This configuration doubles the maximum amount of current (and thus power) the +12 V output can deliver. This power supply uses two STPS6045CW Schottky rectifiers, which can deliver up to 60 A each. One power Schottky rectifier for the +5 V output. On this particular power supply one STPS60L30CW was used, which supports up to 60 A. One power Schottky rectifier for the +3.3 V output, being the main difference between high-end and low-end power supplies (as we have just shown you, on low-end power supplies the +3.3 V output is generated through the +5 V line). On the portrayed power supply the circuit used was a STPS30L30CT, supporting up to 30 A. 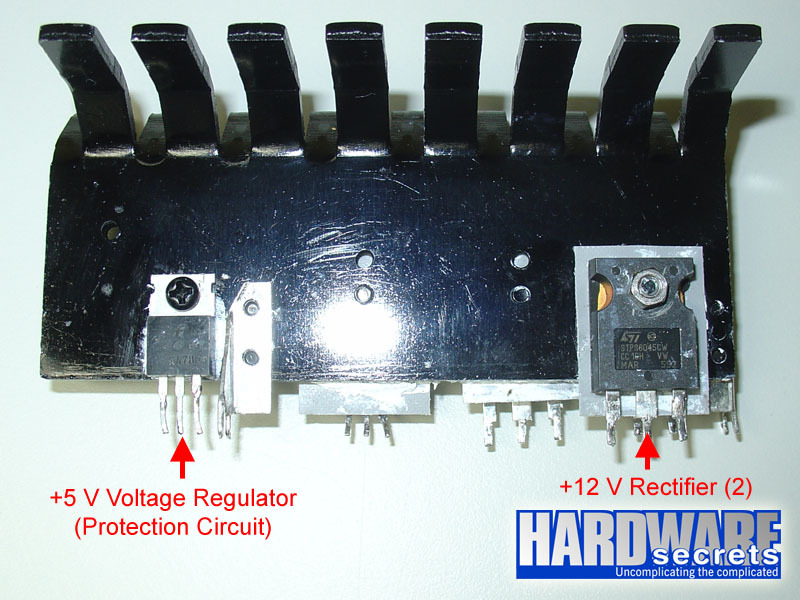 One voltage regulator from the power supply protection circuit. This kind of feature varies depending on the power supply model. Note that the maximum currents we published are for the components only. The maximum current the power supply can actually deliver will depend on the other components that are attached to them, like the coils, the transformer, the gauge of the wires used and even the width of the printed circuit board traces. Just as an exercise, you can calculate the maximum theoretical power for each output by multiplying the rectifier maximum current by the output voltage. For example, for the power supply pictured in Figure 30 its maximum theoretical power for its +12 V output is of 192 W (16 A x 12 V). But keep in mind what we’ve just said on the above paragraph.